The New York Times reports today that the transition to low-sulfur diesel fuel is proceeding rapidly and trucks, buses and other diesel vehicles across the country can now fill up with the less polluting fuel. Perhaps the most significant revolution in highway fuels since the introduction of lead-free gasoline, the new ultra-low sulfur diesel fuel has just 3% of the sulfur previously found in diesel fuel. Like lead, sulfur generates air pollution that leads to severe health consequences. Like lead, it also gums up the works of fine-tuned pollution control devices, making it exceedingly difficult to produce cleaner-burning engines. The new low-sulfur diesel fuel standards call for fuel with an average sulfur content not exceeding 15 parts-per-million (ppm), a 97% reduction from the previous sulfur content standards, 500 ppm. The transition to low-sulfur diesel began in June 2006 in order to prepare U.S. diesel vehicles for the new stricter Federal Tier 2 emissions standards scheduled to be implemented in 2007. The low sulfur content enables the use of catalyst-based exhaust after-treatment pollution control devices that will further reduce emissions of particulates, oxides of nitrogen, and other diesel exhaust pollutants as the new Tier 2 emissions standards are phased in next year. The new fuel will thus pave the way for new generations of diesel engines that will eventually cut lethal particulate pollution from diesel tailpipes an estimated 95 percent, according to the Times. The transition to the new fuel is occuring swiftly, according to the Times. As of Sunday, at least 80 percent of the diesel available for trucks and buses has to meet the new standard, the Times reports, and officials of the Environmental Protection Agency said Tuesday that the changeover was occurring so swiftly that 90 percent of the fuel would soon be compatible. Apparently, the Bush administration is trying to claim this accomplishment as its own, ignoring the fact that the regulation has it's origins in the 1990's and the fact that it became effective in December 2000, before President Bush took office. Old diesel engines burning the cleaner fuel will reduce dangerous particulate emissions by 10 percent, experts say. New engines with improved controls, which have to be available by Jan. 1, will cut this particulate pollution by more than 95 percent. The rule mandates more improved engines in 2010. It is unclear how soon existing trucks and buses, which often are in use for more than 10 years, will be turned in for newer models. 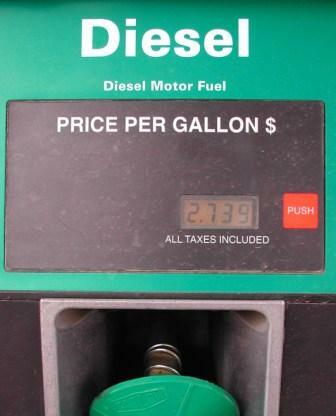 The new fuel is expected to cost 3 cents to 5 cents more per gallon. Like many regulations that took effect in the twilight of the Clinton administration, the diesel rule, covering fuel and the seven million trucks and buses on the roads, was temporarily stayed by the Bush administration. Then the Environmental Protection Agency allowed it to proceed and in 2004 supplemented it with a similar rule requiring tight controls on engines in off-road equipment like cranes, tractors and construction equipment. Leading environmental groups linked arms with industry in a chorus of praise for the new fuel and engines to follow. They emphasized the health benefits and the novel wording of the rule. Unlike earlier regulations, the new rule links the development of the new fuel to developing cleaner-burning engines. Richard Kassel, a senior lawyer and air-pollution specialist with the Natural Resources Defense Counsel, said that when planning for the rule began in 1995, gasoline-powered cars outnumbered diesel-powered trucks and buses by 190 million to 6.7 million. Mr. Johnson said diesel engines had been the workhorses of the economy and the vehicle fleet. The relatively high sulfur levels in diesel have been a significant obstacle to producing diesel-powered cars that met federal environmental standards. Several engine and automobile manufacturers have signaled that more high-mileage diesel-fueled cars, a fixture on European highways, may become available. Allen Schaeffer, executive director of the Diesel Technology Forum, an industry group, said in a conference call Tuesday that the new standard was also significant because it “opens up the door of possibility” to a new generation of light-duty diesel cars and trucks in the United States in the near future. The environmental agency estimates that when the current truck and bus fleets have been replaced and all are using the heavy-diesel engines that will become standard-issue next year, the new rule will prevent 8,300 premature deaths annually. In the Clinton and Bush administrations, the development and roll-out of the diesel rule for trucks and buses has been notable for the cooperation among industry, the government and environmental groups, officials of the three groups have said. Margo T. Oge, director of the office of mobile sources in the agency’s air division, said Tuesday that the speed with which the new fuel became available had exceeded the agency’s expectations. Carol M. Browner, the administrator who signed the original rule, bristled on Tuesday at the Bush administration’s proprietary attitude. The new low-sulfur diesel fuel will also pave the way for clean diesel cars and light trucks in the coming years. Diesel vehicles utilize more efficient engines and get better gas mileage than gasoline vehicles, a benefit that has traditionally been offset by higher tailpipe emissions than gasoline vehicles. Diesel vehicles are very popular in Europe, but have had less success in the United States, partly because of perceptions about dirty emissions. The new low-sulfur diesel fuel and new diesel vehicles capable of meeting the strict Tier 2 emissions standards will mean that the diesel vehicles of the near future will be significantly cleaner, with emissions comparable to gasoline-fueled vehicles. This will hopefully help overcome the common perception that diesel cars and trucks are "dirty," and will idealy lead to the further market penetration of more efficient diesel vehicles in the North American market.